Fruits and berries will be prepared according to traditional recipes. 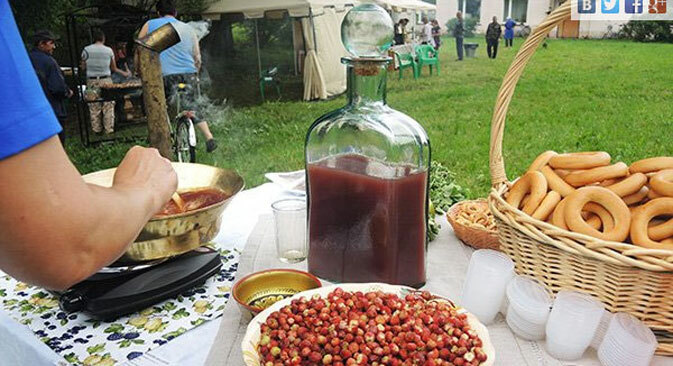 Throughout the summer in central Russia, literary museums based at country estates that used to belong to famous authors will be making “Literary Varenye” (preserves and jams) according to old recipes either described in the writers’ works or used in their households. “Literary Varenye” is a project by the Voronezh branch of Rossiyskaya Gazeta to mark the newspaper’s 25th anniversary and the Year of Literature in Russia. The first 4.5 kg (9.9 lbs) of a delicious berry dessert was prepared June 27 at the Spasskoye-Lutovinovo estate in Orel region that used to belong to Ivan Turgenev. The recipe was uncovered in the museum’s archive: the author’s mother used to prepare rose water from local flowers and to cook a strawberry preserve with it. “Varenye symbolizes family traditions that unite generations, who cook it together and then together drink tea in the evening, listening to grandma’s tales,” says project mastermind, Svetlana Kolesnikova. Incidentally, Russians sometimes wish each other a happy varenye instead of a happy birthday (the two words sound alike in Russian and are associated with a festive mood). “Family homes, aristocratic (including literary) families were always very good at keeping up traditions, that is why in the Year of Literature we decided to cook varenye at country estates associated with literature,” Kolesnikova explains. After the first jam session at Spasskoye-Lutovinovo, it turned out that “Literary Varenye” is also a way of attracting tourists to writers’ estates. Museum staff stage special events with excursions and games, and uncover old recipes in 19th century archives. All the cooked preserves will be packed in jars with Year of Literature logos and sold, with the proceeds going to charity. On July 25, the varenye festival will arrive at dramatist Alexander Ostrovsky’s Shchelykovo estate outside Kostroma. The highlights there will be include an 1809 recipe of a gooseberry and lemon preserve cooked in cherry water. On Aug. 16, varenye lovers will be able to buy a jam made of apples from the orchard on the estate of Princes Tenishev in the village of Flenovo in Smolensk Region. In the 1950s, it became home to a Russian-themed history and architecture complex, Teremok, displaying works by Nikolay Roerich, Mikhail Vrubel, Ilya Repin and other famous Russian artists. On Aug. 19, the edible library will have another apple jam added to it. It will be cooked in Ryazan, in the courtyard of house of Nobel Prize-winning physiologist Ivan Pavlov, who was friends with many literary figures. Visitors to the event will also have a chance to play gorodki - Russian skittles - and croquet. In September, varenye will be made in Voronezh and Lipetsk regions – in the house museums of Samuil Marshak and Ivan Bunin – as well as at the railway station of Astapovo, where Leo Tolstoy spent his last days.